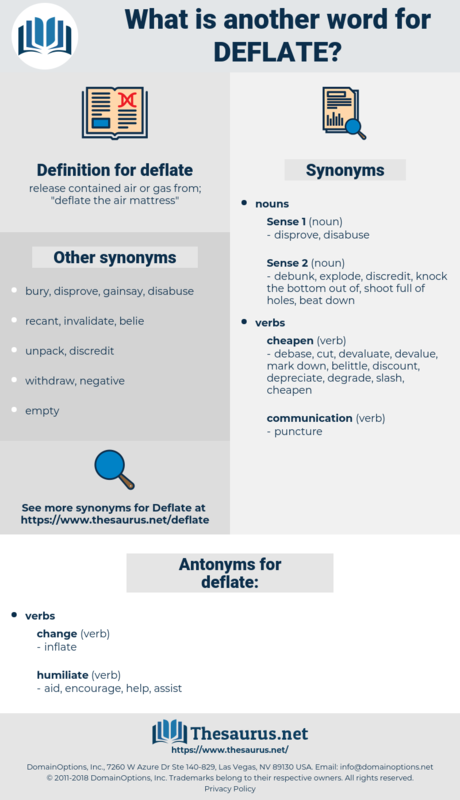 What is another word for deflate? 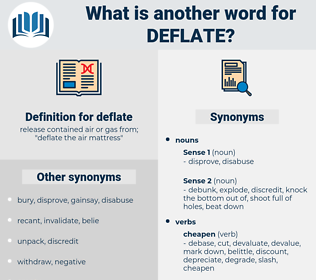 release contained air or gas from; " deflate the air mattress"
develop, grow, expand, increase, raise, build up, boost, enlarge, blow up. defoliate, debilitate, depopulated, depopulate, dabbled, devaluate, double-dyed, doubled, diploidy, deflated, defoliated, double date, doublet, deplete, devalued, deadbolt, double dye, defiled, diploid, devilwood, debilitated, double-date, debility, default, deep-laid, defilade, depilate, depleted, dappled. cut down, bring down, reduce, trim, fall, diminish, modify, trim down, change, trim back, cut back, alter, decrease, cut, lessen.